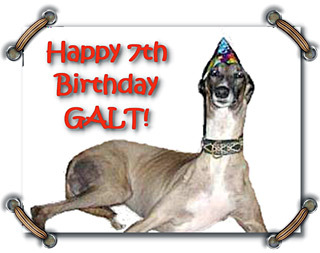 Saturday, May 17, 2008, was GALT's 7th Birthday, and what a PARTY IT WAS with an afternoon of festivities at Pilot Knoll Park on Lake Lewisville in Highland Village, Texas. Over 145 humans and their Greyhounds (wish we could have counted all of the Greyhounds) attended, making it one of the largest hound-attended events in GALT's history! The weather was as expected - a warm, breezy late spring Texas day on the lake! It was a down-home barbeque with smoked brisket, chicken, and sausage, prepared by GALT friends Joe and Anita Roberts. Kris Schuster coordinated all the food and added some of her famous additions of baked garlic and onions, together with all the usual "fixins." Holly Goodlett baked doggie treats of mini muffins that were so luscious, some of the human parents were tasting them! YUMMMMMMMMMM said all the dogs! And of course there was chocolate and vanilla birthday cake for the humans. The City of Highland Village fenced an area on the lake that could be used as an off-leash play area for the dogs. They took full advantage of it (and more). For safety reasons muzzles and human attendants were on hand. The dogs had a glorious time without incident. GALT volunteers were everywhere. They helped at every venue, watched the dogs run in the play area, waded into the water to "corral" the dogs that wanted to swim to Oklahoma, trimmed nails, served food, sold merchandise, registered guests, sold raffle tickets, held dogs, and just generally helped wherever needed. GALT appreciates the donation of their time and efforts! Speaking of the raffles, the winners were: Reagan Jensen, Brad Walker (new adopter of Mark), Jhon Estrada (winner of two items), Tiffany Smith, Molly Brotherson, Holly Goodlett, Mary Hoiles, and Carol Jensen. Many people made purchases from GALT's Greytstore, took advantage of the nail trimming, took the Canine Good Citizen test, had portraits of their greyhounds sketched by art students of Flower Mound's Marcus High School, and had their hounds microchipped (donated by Dr. Jeff Ellis of VCA Preston Park Animal Hospital). Dr. John Harvey of Cross Timbers Animal Medical Clinic was the "doctor on duty" to answer all those Greyhound questions! Royal Image Beaded Dog Collars and Camp Greyhound Designs attended as vendors, and everyone was glad to see their lovely wares! The members of GALT's family who traveled the longest distance to come celebrate were the Jones' family, Marion, Lonnie and Kyle, from Amarillo with their eight Greyhounds! After an exhausting afternoon, there wasn't a dog standing on the way home! We hope to see you all again next year and in years to come. Thanks for helping GALT celebrate its first seven years!